• Available in sizes from 9/16" - 4"
Carbide tipped annual cutters are used when you need maximum performance. Specially engineered for tough materials, these cutters will continue to cut when others fail. 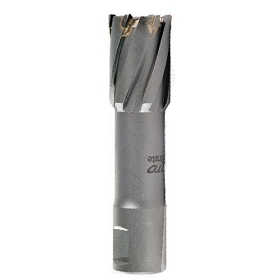 Cuts holes in cast iron, steel, and ultra high alloys. When used under the proper conditions cutters are reported to last for 1000 holes.